This review is about a binary options scam called “Profit Maximizer” or “Max Your Profit“. It is presented by James Forley. Forley says that Profit Maximizer is a binary options trading system that has made him more than 2 million dollars. Now he is offering you his trading system for free. Forley’s story is completely bogus and Profit Maximizer is a scam designed to make money to scammers. In case you have not noticed it, the bank account statements that Forley shows you in the video are fake. You can see it in the animations that are obviously faked, he does not log into real accounts. All testimonials shown in the Profit Maximizer video are made with paid actors, none of them is real. These people just said what they were paid for, they are not real users of the system. On the top of the Profit Maximizer page you can see a fake counter of free spots remaining. Just reload the page and the counter will be full again. It is there just to put you under pressure so that you don’t look for real reviews of Profit Maximizer like this one. In reality Profit Maximizer is not free, you will have to deposit at least $250 with a selected broker in order to be allowed to use it. Then you will trade your account with the software and lose money. But scammers will get their commission for referring you to their broker. That’s how it works. 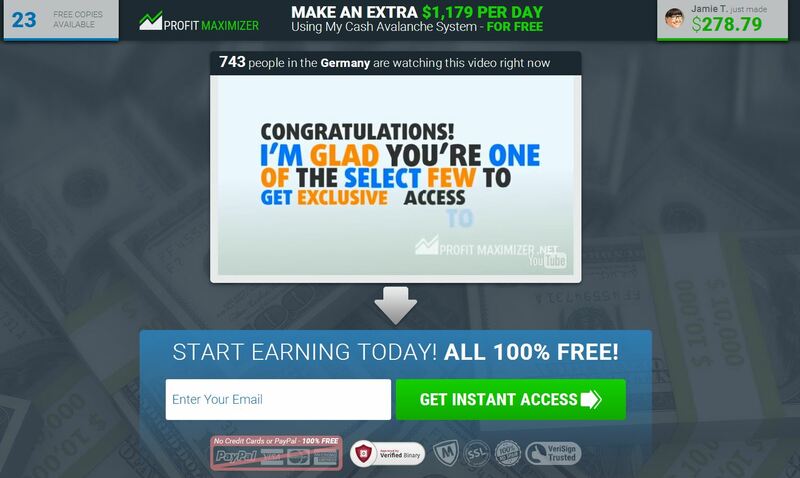 Profit Maximizer is a simple scam that abuses binary options to take money away from you. Never trade any binary options system until you could try it on a free demo account and verify its performance.